GREEN BIKERS ON THE ROLL! 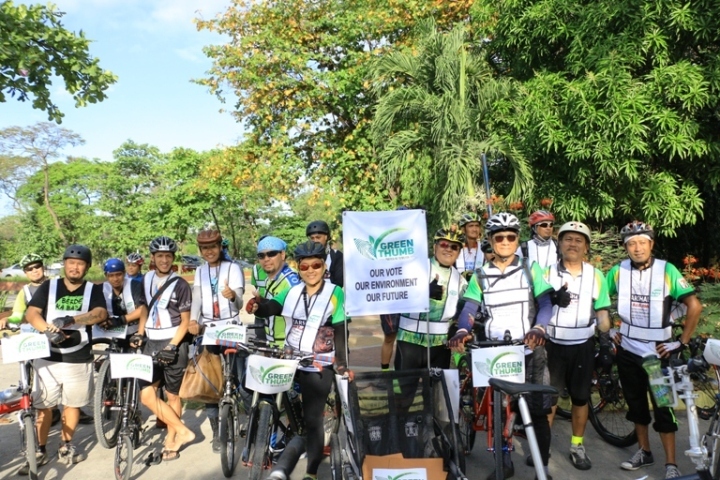 Thirty bikers, who are members of Green Thumb Coalition, traversed the roads of Quezon City Circle all the way to presidentiables’ headquarters in Quezon Ave. (Sen. Miriam Defensor-Santiago), Scout Borromeo (Sen. Grace Poe) and Cubao (DILG Sec. Mar Roxas) to deliver green score cards that will determine their stand for the environment. The green score cards for Vice-Pres. Jejomar and Davao City Mayor Rodrigo Duterte will be sent via courier. The Green Thumb Coalition (GTC), representing various civil society and environment organizations, released the ‘Green Thumb Score Card’ – a set of questionnaires about different environmental issues that will be distributed to presidential, vice presidential and senatorial candidates running for the 2016 elections. The Coalition’s “Ano ang Score ng kandidato mo?” Press Conference raised 50 questions delivered by a group of bikers from GTC which determine the green score cards of the running candidates based on their stance and answer about the issue. Lipa City, Batangas Archbishop Ramon Arguelles stated, “…ang gusto naming bigyan ng diin sa Batangas at sa buong Pilipinas ay, let this issue be the number one issue sa eleksyon na ito”. The Archbishop is also delighted to see people unite against mining. Ms. Gina Lopez, Chairman of ABS-CBN Lingkod Kapamilya Foundation, Inc., affirmed that she will not endorse anyone until the score card is filled. “ …fill up the score cards and afterwards you will see that it is really democracy and science in action”. Ms. Gina Lopez also presented the destruction caused by 24 mining companies in Mindanao. She also showed videos of current electoral candidates who prioritize the environment in their platforms. The Green Thumb Score Card will further help the voters by publicly presenting the different positions of candidates on biodiversity, natural resources and land use management, sustainable agriculture, human rights and integrity of creation climate justice, mining and extractives management, energy transformation and democracy and people-centered sustainable development. Electoral candidates will be scored according to their positions and track records. The Coalition stressed the need to discuss about environmental issues , and call on the candidates to present strategies to lead the country for the next six years. The recent Green Vote campaign that gathered 10 million votes illustrates that environmental protection is one of the major concerns of the Filipino voters. The Green Vote seeks to address major issues that debilitate our ecosystems, such as mining, dirty energy such as coal, and waste incineration. In the end, the GTC educates the voters, mobilized communities and hold candidates accountable for their positions, in order to properly identify candidates who have concrete plans for the environment and strategies to fight climate change. In Photo: (Left - Right) PAENG LOPEZ, Country Program Director Global Alliance for Incinerator Alternatives (GAIA), VINCE CINCHES, Oceans Campaigner Greenpeace Southeast Asia, GINA LOPEZ Chairman ABS-CBN Lingkod Kapamilya Foundation, Inc., MOST REV. RAMON ARGUELLES, D.D.Archbishop Lipa City, Batangas , JAYBEE GARGANERA, National Coordinator, Alyansa Tigil Mina, GLENN YMATA, Energy Officer, Philippine Movement for Climate Change, ATTY. AARON PEDROSA, Secretary General, SANLAKAS release the “green score cards” for all the electoral candidates.